Do you have a secret desire to dress like an Astronaut on one of NASA's shuttles? Will you be blasting off into space, orbiting the earth, or taking a little space walk? You really need to know this before you select your costume, because that will determine which color you should select. The main colors used for these special NASA uniforms during the shuttle program were blue, orange, and white. Different colored space suits ones were specially designed and constructed to serve different purposes. On this page are some examples of each of the three familiar shuttle uniform colors, and how each was used. Here, Challenger's crew of STS-8 poses in their Nomex NASA Royal Blue blue flight suits. These would have been the suits they wore on August 30, 1983, during liftoff, and on September 5, when Challenger landed at Edwards Air Force Base in California. After the first shuttle disaster, the pressurized orange ones were used during the crucial beginning and ending of missions. You don't have to think very hard to imagine that these must be by far the most comfortable of the three uniforms. STS-8 was a mission of firsts: Not only was Mission Specialist Guion Bluford the first African American to go into space, but this was also the first nighttime launch and landing. It was just after liftoff for mission STS-51L on January 28,1986, that the disaster struck. Challenger and her crew were lost in the sky over Cape Canaveral. Wear an orange jumpsuit like the one worn by the astronauts that flew on NASA's space shuttles during launch and re-entry. Or, choose a white one. Space suits used for EVAs (Extra Vehicular Activities) were usually white. 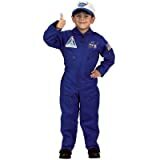 Because shuttle astronauts often had official photographs made in their blue flight suits, these are also very familiar to us, and make great Halloween or stage costumes, too. 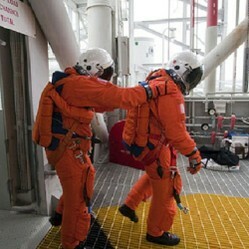 The ACES (Advanced Crew Escape Suit) was the successor to the orange LES (Launch entry Suit). They were nicknamed 'pumpkin suits' by those who wore them. There's no explanation necessary for that nickname, is there? Up through 1986, crews wore their blue flight suits, with helmets, during launch and re-entry. During the shutdown of the program following the loss of the Challenger, it was decided that pressurized suits designed for escape were a must, and NASA used LES from the time flights resumed. ACES replaced them about 10 years later. Interestingly, the very first design of the LES was in a dark blue. But those were never worn in flight, and the color was quickly change to orange. Why? If something ever went wrong, and astronauts ended up needing to be plucked out of the sea, bright orange would be a whole lot more visible against the color of the ocean than dark blue. That's for sure! The Discovery crew, wearing their ACES suits, posed for the above picture in front of the bus that would take them to the launch pad for that shuttle's final flight. Discovery is now on display at the Steven F. Udvar-Hazy Center (part of the Smithsonian) in Virginia. Have You Ever Dressed Like an Astronaut? The space shuttle astronauts wear specially designed suits when taking a 'space walk,' or performing extra vehicular activities. The multiple layers of these EVAS do different things, and combined, they are designed to allow movement in the vacuum of space, where there's no gravity, no oxygen, temperatures from over 100 degrees (F) below 0 to above boiling, and a lack of atmospheric pressure. In the above photo from mission STS-125, John Grunsfeld works on the Hubble Space Telescope, during a lengthy EVA that lasted seven hours. The ten day long mission, aboard Atlantis, which was commanded by Scott Altman, launched on May 11, 2009, and included five space walks. Like many Americans, Atlantis retired to Florida. The last shuttle to fly is now on permanent display at Kennedy Space Center - suspended at the precise angle of 43.21 degrees. (Get it? 4-3-2-1 - Liftoff!) Incidentally, the telephone area code for the area that includes the space center is 321. Learn More About a Fascinating Topic! The orange, white and blue uniforms shown on this page were the standard during a large part of the shuttle program, and certainly during the last 15-20 years of flights. But they are not the only colors ever worn. For example, on the first few flights, the Ejection Escape Suits were a golden or mustard color, like the ones in the photo at right. If you were to travel back in time to the days of the Mercury and Gemini programs, you might see John Glenn dressed for a Mercury launch or Neil Armstrong training for a Gemini mission is bright and shiny silver. However, though other colors have been used, there's a lot of color continuity. When America first sent men to the moon in the 1960's during the Apollo program, the flight suits were blue and Neil Armstrong first stepped onto the lunar surface wearing a white EVAS. If you were to wear a space suit, which one would you prefer, and why? CruiseReady, An article on and the product line for the accessories, such as footwear, would be just as fascinating! These space suits would make nice halloween costumes... just add a helmet! And, it's nice to know what kind you are wearing, in terms of its purpose. Nice way to have a Halloween costume group shown. Thanks for your comments. I love the blue ones myself. My grandson got one of those years ago when he went to space camp at Kennedy Space Center. He looked so dapper in it! I loved all the colors and the interesting stories behind the space suit colours. I really hadn't given any thought to the colour codes of Nasa's space shuttle dresses. Personally, my favourite colors for space suit would be the fiery orange and the cool white shade. Yes - it's incredibly dangerous, but still, such an honor to be chosen! That was very interesting. I always thought they wore bright orange in case they had to be found after an ocean crash or something. I guess the white one used at the space station stand out against the dark sky. We often forget how dangerous being an astronaut is.